Chipping with the correct loft at impact (dynamic loft) and making solid contact is vital to controlling spin, launch angle, and distance. I see players of all levels misunderstanding what solid contact means in chipping and this leads of a misunderstanding of how proper technique should be applied. This will be a shorter articles with a three of the major points but if you would like a further explanation please contact me. Before we get started we are going to play a little game and I am going to ask you to use your imagination and after watching the following video and before continuing reading the remainder of the article I would like for you to form an opinion on what type of contact this chip shot be and what the out come of this chip would have been. These three things are crucial to understand if you want to become a efficient chipper of the golf ball. Understanding these aspect of the game and practicing them will help you reduce the amount of practiced need long term to maintain your short game shots. Most players think that they have to hit the ball first to make the ball spin. This is simply not true. This is why I see most players start with the club leaning in front of the ball at impact and then the try to return the club to impact with the shaft leaning forward of the ball to help ensure they are hitting the ball before the ground. As you can see in the video above this is not the case. Players that play for a living would only lean the shaft forward to the extreme most amateurs do if they were going to punch a shot low under some trees to get back in to a fairway. A simple fix for this is to try to lean the shaft less forward at address and impact. Adding loft at impact sounds like a odd thing to say, but this is why I encourage players to experiment with range of clubs from 9 iron down through a lob wedge. I would rather have players simplify their wedge game and have a similar chipping style and vary the club and not so much the technique to create different heights and spins with one wedge. Adding loft would also be another way of saying try not to lead the shaft forwards at impact. I do not like to see plays add loft through opening the face to the target line, as that can cause side spin or the spin axis to tilt left or right (fade or draw). Adding loft at impact with a relatively square face to the target line can give you larger amounts of spin be also chip shots that release towards the target. So, when adding loft at impact that would not mean opening or closing the face at address and impact. Think more about shaft lean at impact to help gain spin and loft at impact. Bounce is a very impact aspect to have fit and understand with your wedges and can absolutely effect how efficient your chipping can become. This is where player typically misunderstand their equipment and players try to lean the shaft forward at impact and deloft the club at impact to hit the ball first. 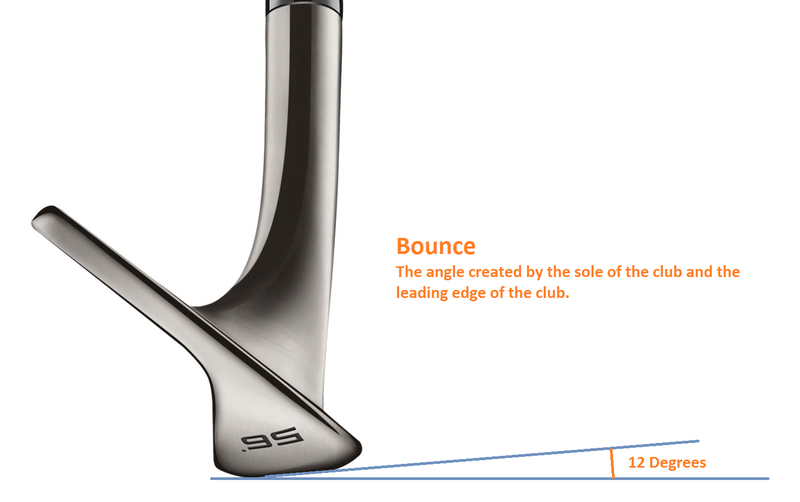 The bottom of this club is what should be contacting the ground first during impact, not the leading edge. Players that have steeper angle of attacks and players that have more shallow angle of attacks will have different needs and this can be fit quit simply. Think about the above example and the 12 degrees of bounce on this wedge. This means that if we where to lean the shaft forwards more than 12 degrees at impact the leading edge would be hitting the ground first and the club could potentially dig into the ground too early. The bounce helps the bottom of the club drag along the ground and prevent the lading edge from digging into the ground if used correctly. This is why you can have early ground contact and still hit a solid shot. So in conclusion when a player is not learning the shaft forwards as much, adding loft at impact, and using the bounce correctly there could be some slight ground contact before the impact of the ball. This happens every day for professional players and they understand how to control their bounce, shaft lean, and dynamic loft at impact. This is why they make it look so easy, because most armatures make this shot much more difficult by not understanding and utilizing these areas in their chipping. These have just been three areas of a solid chip shot and there are certainly more advanced areas of chipping that need to improve for the advanced players. Every player is different and needs different corrections, so if you would like a further explanation and understand the exact correction for your game contact me and we can setup a specific set of fixes for you. I am going to leave you with a good short clip and example of what we are talking about here in the article.